While the pterodon carries Letherhead off, Don and Emur try to negotiate peace with the Amazons, but things don’t go so well. Emur suggests that Don and he should try to escape on a pegasus – but the animal will not fly when our heroes jump onto its back. The Amazon leader is impressed with their bravery, and so she offers to hear them out. As the group discusses the strange place known as Hollow Earth, they are attacked by a monstrous insect that emerges from the sand. Don and Emur are joined by the Amazons in battle and the monster flees. The Amazon leader is impressed with our heroes fighting abilities and she offers peace. The Amazons have mounted chariots to their pegasus and are heading out to Darkuroz, an outpost of Atlantis, where the Amazons have seen flying spacecraft in the past. 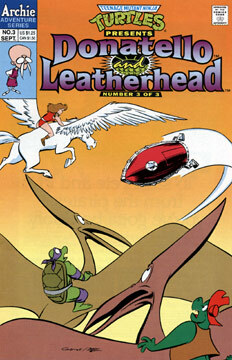 As the group travels, they’re surprised to see the pterodons fly in to meet them – with Leatherhead riding on one of the dino’s backs! It turns out the LH was also able to convince the pterodactyl not to harm him. Suddnely, an earthquake begins to destroy the road they were following, so Don and LH jump onto the pterodons while Emur joins the Amazons on the pegasus, and the group flies to Darkuroz. As soon as they find the golden city, they spot numerous spacecraft flying around. The ships zap our heroes with a ray that forces them to land, and they’re greeted by Murtal. Everyone is angry at the diminutive man and demand to know why they’ve been brought to this strange place. Murtal tells them that they deserve to know the truth, and removes his disguise… it turns out he is one of the last Atlanteans – who came to the Hollow Earth eons ago after they destroyed their homeland in a military accident. The fall out radiation from the accident caused the Atlanteans to mutate – and they knew they wouldn’t be welcome on other parts of the Earth because of this, thus they fled to Hollow Earth – where time passes extremely slowly and no one seems to age, allowing people and animals from all different eras to live together. Murtal then goes on to explain that the remaining Atlanteans brought everyone here because they were lonely and wanted to populate their new home with things that reminded them of the surface world. When the forlorn Atlantean asks if he can do anything to make up for his actions, Don and Leatherhead ask to be taken home, and the Amazons ask the Atlanteans to help them lead more comfortable lives via their technology. Murtal agrees to their requests. Emur decides to stay inside the Hollow Earth and help them build a new society with the Atlanteans’ help. Don and LH board Murtal’s ship and are taken back to the junkyard where the adventure began.